Piano legs and cabinets suffer greatly from rolling them here and there on the original casters, not to mention to your floor. A piano rolled on carpet can raise a wave in front of the wheel as it moves along, and if it catches on the wave, the carpet will fold, and the wheel can easily rip the carpet. Also, the tune is easily lost at door jams and rough spots. A grand piano should never be rolled around on its original wheels. A caster can catch, and the leg will easily rupture, even dropping the piano. Beyond this, a run away piano, or a piano which tips over, can cause injury which can be far more costly in insurance claims than the cost of one of these trucks. Think about it. Look at the trolleys below. Which one is best for you? Do you see those nice shiny tuning pins? the harsher the bounce when you hit a mic cable or door sill. If a tuning pin wants to let go, it will do it as you jar the piano. and save the legs from being ruptured when a wheel catches. Piano trolleys are not pretty, but neither is a busted piano. We have the largest Piano Moving Selection on the Web. PLEASE CONTACT US FIRST IF YOUR INSTITUTION USES A PURCHASE ORDER. We prefer a credit card payment or check in advance. and that is all we charge. Remember, we charge only actual shipping. Consider that when comparing us with the competition. The three spider trolleys we offer are very heavy and safe trucks. 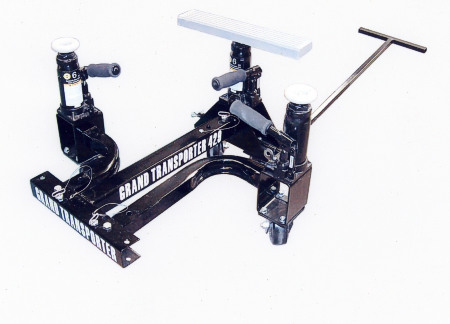 They are seen in the graphic as 03542-3-4 If casters are removed, the piano is only raised 2½ inches off the floor which allows for normal height of the pedals. The casters have heavy ball bearings. Shipped unassembled in two cartons. You MUST remove the wheels from the legs before setting the piano on the trolley. Be sure to store the wheels where no one will disgard them. The safe way to take the wheels off is to remove each leg, one at a time, and remove the casters and their sockets. The end of the leg MUST fit down into the recessed cup to be safe. When you are ready to put the piano on the trolley, if you have questions-- Call (800) 338-8863 or (715) 803-4556. These trolleys will NOT be right for concert grands with 5 inch wheels. Normally the wheels are 1-1/2 to 2-1/2 inches in diameter. 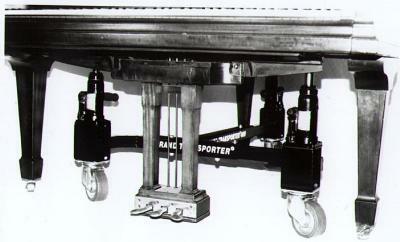 If you have the 5 inch wheels, we can supply a special trolley for your piano. Shipping: UPS now ships "Ground" to Hawaii and other off shore US territories. It is still about twice USPO Parcel Post. BUT, beware, for if Parcel Post gets lost, the USPO will take six months to finally resolve the issue. You will NOT be paid back or be free of risk to reorder until the USPO pays us back. Carton One-- 27 by 14 by 9 inches-- 61 lbs. Carton Two-- 33 by 16 by 3 inches-- 43 lbs. All trolleys come with a brake on two wheels. trolley. Please call for information. CAUTION: Kawai, Young Chang, and Yamaha grands up to 6 foot 1 inch must use trolley SH4012 These brands over 6 foot 1 inch must use SH4013 up to 7 foot 6 inches. Over that, use SH4014. SEND MAIL if in doubt. Please give us the model number and the length of the piano MEASURED UNDERNEATH FROM THE FRONT OF THE PIANO UNDER THE KEYS TO THE FAR END OF THE CURVE. grands. But, it will take the smallest grands. One good reason for ordering this trolley is that, if you change pianos, this trolley can be used on the next piano. The wheels are "Hi-Tech 5" five inch casters. It is painted only in black. the above three models of spider trolleys will NOT work. We offer a special trolley to accomodate these pianos. 1. The professional who sells a good number of spider trolleys will want this Transporter to lift grands and prepare them to be set into place on the spider trolley. 2. Concert Halls and institutions will want this in place of spider trolleys. 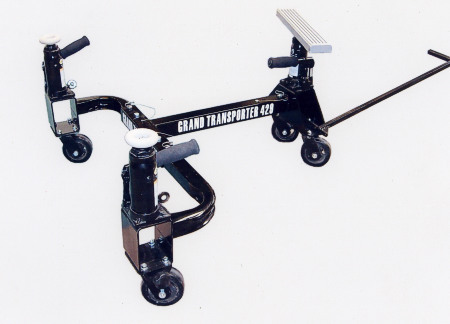 This transporter has hydraulic jacks which lift the grand piano easily and quickly. Then the piano can be rolled from storage to the position where it is needed. The piano is then set in place on its own casters. This saves money where several pianos must be moved about, and the piano looks much more appealing sitting on its own casters during the concert. Also, direct contact with the stage floor allows the sound energy that flows through the legs to sound through the floor, providing greater "presence". You must have doorways wide enough to move the grand piano through in its normal position, or about 60 inches minimum wide. Load limit- 3000 lbs. Lifts from 22 to 31 inches. playing fields easily without the wheels sinking in. CAUTION: Keep the tires fully inflated at all times. soft polyurethane 8 inch diam. tires. Handle included. All Terrain model. Heavier frame, large 9" pneumatic tires. The Handle Kit is optional for the SN 429 and SN-AT and must be purchased separately for $ 85. NOTE: Prices are $100 higher for international orders due to the amount of paperwork required for international shipments. See illustrations at the top of the page. very much safer than rolling a piano on its own casters. The chance of floor damage is also minimized. Upright trolleys are not safe to use in moving a grand piano. Spinet and Console Piano Truck- See also 03545 in graphic above. to the truck to actually bolt the truck to the piano. This is the ONLY trolley which is safe to use with a spinet or any piano with free standing legs. and Yamaha uprights. The opening receives pianos with a cabinet depth of 12 to 18 inches. 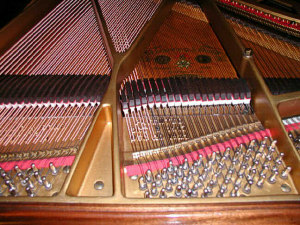 to avoid damage to the piano and use straps to secure the piano. Very good for consoles which are frequently moved in various institutions. of the piano, to connect the trolleys to the skid board, is a very good idea. This is the most common one used in schools, churches, and nursing homes. Depth of cabinet opening, not measured at the arm (see graphic), 15-1/4 inches. Total dimensions are 22-1/4 by 8-1/2 inches. Weight 22 lbs. CAUTION: These are not recommended for spinets with free standing legs. on something, even on someone's toe, and breaking off the leg. remove the legs and store them. depth or less. Will handle the biggest old monster upright. down and attaching to the bottom and rear (need to drill holes). Overall dimensions of each trolley are 28 by 9 inches. Weight 44 lbs for the pair. We have told a number of you that we could not find a narrow doorway trolley. Well, here is one finally, and it takes care of the need. Do be aware though that the center of balance is closer to the back of the piano with this one. This truck must be custom made by our supplier. Neither in front nor in back. It is given a powder coat black finish. The adjustment on this new product provides a more steady posture of the instrument and the dolly together. Adjustment is possible for both the length of the instrument overall, and for the length of the side feet. Possible damage to the legs of the instrument is eliminated because sudden grabbing of casters which catch on something is absorbed the the frame. Improvised modification by the customer attaching the back panel of the instrument to the back bar will make the instrument even more secure. The foot 9-1/2" by 14" pedal guard is very important since some instruments, like the Clavinova, have a plug under the pedal area which like to catch on door sills etc. The two front single wheels lock preventing rolling around while playing. Finish is black powder electro-plated. 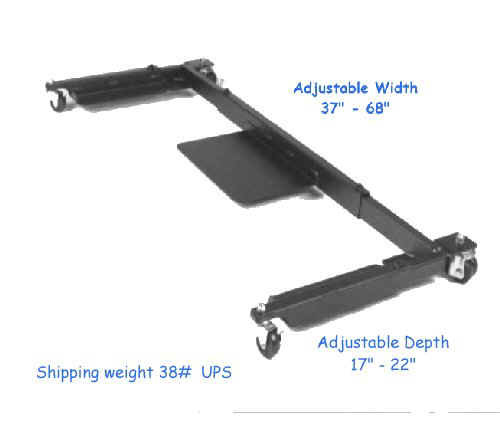 Some digital pianos require this dolly to be made with a deeper center plate. Please provide instrument brand and model when ordering. Also available Digital Grand Dolly Price $567.